The Amalfi Coast is for its uniqueness and beauty and an Amalfi Coast honeymoon is sure to amaze even the most seasoned travelers. Are you looking for a honeymoon destination that will fulfill your desire for a once-in-a-lifetime experience? Look no further than this 50-kilometer stretch of Italian coastline. Amalfi Coast honeymoons are popular because of the remarkable beauty of this dramatic coastline. It’s also known for being culturally vibrant and artistically entertaining. Even the road that winds its way down the coast, the Amalfi Drive, is legendary for its thrilling twists and turns. You can enjoy a lovely morning boat ride, and then become one with nature and art as you sip some afternoon wine. Then you can let loose after dark as you dance the night away. 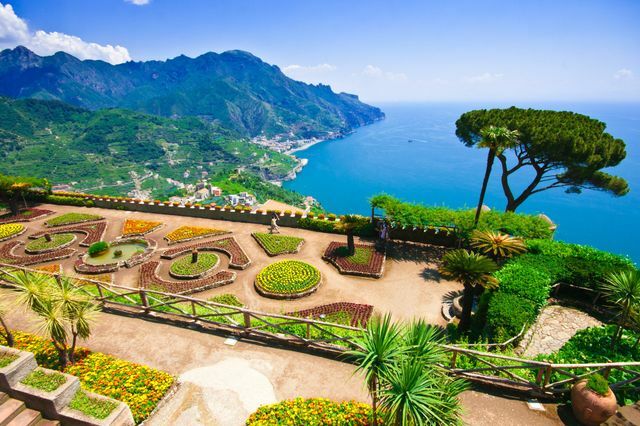 There's so much to see and do that you'll never want to leave your Amalfi Coast honeymoon. The Amalfi Coast, like much of Italy, tends to be full of tourists in the warm summer months. Autumn, however, is known as the season of the grape harvest, so it is a great time for wine lovers to visit and enjoy an Italy honeymoon. Museo Correale: Visit this 18th-century villa during your Amalfi Coast honeymoon to admire Neapolitan artwork. Spaggia di Lauriot: Go swimming in this tiny cove. Montepertuso: Visit this hamlet to enjoy romantic fine dining. Pompeii: If you're enjoying an Italy honeymoon, take a day excursion to the incredible volcanic ruins of Pompeii. Festival Musicale di Ravello: Enjoy the enchanting classical music in this small town festival. Villa Rufolo: Stroll through these beautiful gardens and enjoy one of the many concerts held here. Beaches: Relax and soak up some sunshine on the beach. Amalfi Drive: Dare to drive this thrilling road and enjoy gorgeous scenery throughout. Villa Cimbrone: Tour this posh hotel that sits on a hill overlooking the Mediterranean Sea. Africana Club: Dance on top of a glass floor while fish swim beneath you. Anotonello della Mura: Dress like a local by shopping here during your Amalfi Coast honeymoon. The Sant’Antonino Festival: Attend this religious celebration with both a land and sea processional. Sagra del Tonno: Taste fish specialties and enjoy live music at this village festival. I'm very interested in booking our honeymoon in the Amalfi coast, possibly Positano? Has any one ever been? I need hotel suggestions? Hi - anyone ever stay in Sorrento for their honeymoon? Any hotel recommendations or restaurants?